New this year! 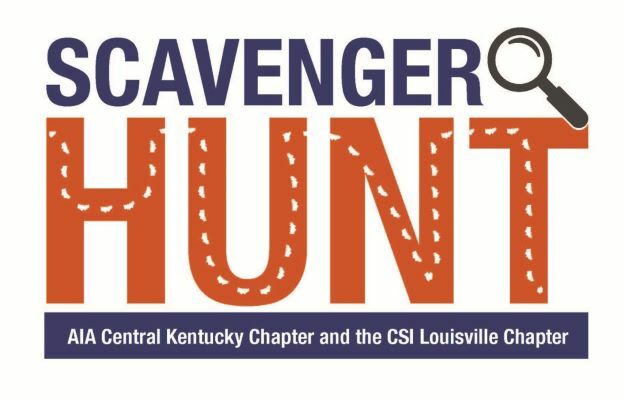 A fun Scavenger Hunt in beautiful Louisville, Kentucky hosted by AIA Central Kentucky Chapter and CSI Louisville Chapters. There will be limited participation, so be quick to sign up! In this Scavenger Hunt, two buses will race to collect points for finding and completing challenges! The challenge list will range from easy to difficult. Proof of completed challenges may require teams to email the photos or videos as requested to the admin team. Meeting Location: The Hub Louisville, 2235 Frankfort Avenue, Louisville, Kentucky 40206, (502) 777-1505. Bus Pick Up and Drop-Off Location, and administrative team to collect and track points. Parking: Street parking should be plenty. Scavenger Hunt Official Time Clock: Buses released at 5:00 PM and return at 7:00 PM. Teams complete as many challenges as possible in the allotted amount of time. Email your pics/videos to aiacsilouisville@gmail.com. The team with the most points as of 7:00pm will be the winner! Scavenger Hunt includes a race of 2 teams: Two teams on separate buses will race to win. Each bus will include 8 sponsor reps and 18 architects. Each sponsor and attendee will be randomly assigned to teams. Registrants with guests will be placed together. There are 7,400 total points available for all challenges. Each bus will be loaded with food and beverages. Scavenger Hunt list of challenges will be provided on day of event. Tickets for Team Vendors: Only vendor sponsorships are available. They are $500 each, 8 total available. Each sponsorship comes with 2 tickets to be on a race team. Tickets for Team Attendees: Available only for architects. Free of charge. Other Tickets: All others not assigned to race teams can hang out at The Hub Louisville and calculate points and have fun while waiting for teams to return at 7:00 PM! No Charge!